Glaucoma affects the optic nerve which is found at the back of the eye. The optic nerve sends visual information from the eye to the brain, allowing us to see (similar to the way the cable cord of a television transmits pictures from the cable box to the television screen). In glaucoma, the pressure inside the eyeball is high enough to cause damage to the optic nerve. Similar to high blood pressure, patients usually do not “feel” the pressure in the eye. Glaucoma is often referred to as the “silent thief of sight,” as visual impairment begins in the periphery and progresses slowly. As the condition progresses, more nerve cells are damaged and the field of vision narrows. If left unchecked, this process can lead to complete blindness. 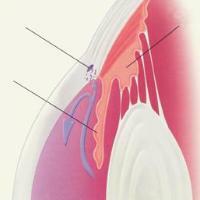 Glaucoma first affects the periphery, and may cause the effect of tunnel vision. When eye pressure rises, it slowly destroys fibers in the optic nerve. As the nerve fibers die, the optic disc gets damaged. 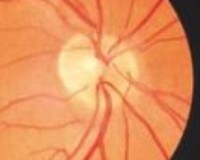 The result is a gradual loss of vision and a “cupped disc” in which the center has become pale in contrast to the healthy tissue around the rim. 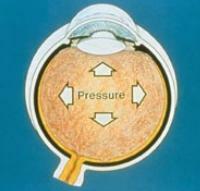 In glaucoma, the pressure inside the eye is elevated. Open angle glaucoma is the most common type of glaucoma in the United States. The drainage angle of the eye becomes less efficient over time, and pressure within the eye gradually increases. More than 90 percent of glaucoma patients have this type. In closed angle glaucoma, the iris blocks the drainage channel and pressure can increase rapidly as in acute angle closure glaucoma or cause scarring over time resulting in chronic angle closure glaucoma. 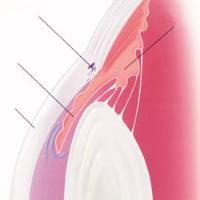 Acute angle closure glaucoma occurs when the drainage angle of the eye is suddenly and completely blocked. It is as though a wash cloth floating near a drain suddenly drops over the opening and blocks the flow. In the eye, the iris may act like that wash cloth, closing off the drainage angle. When this occurs, the pressure goes up and can result in severe eye pain and damage to the vision. Early diagnosis and treatment is critical to preserve vision in individuals with this condition. This condition is more prevalent in patients who are far-sighted and who have not yet had their cataracts removed as the angle (drain of the eye) is more crowded in these individuals. In open angle glaucoma, eye pressure increases gradually. In closed angle glaucoma, the iris blocks the drainage channel and pressure increases rapidly.